“The pope is not infallible.” When the newly elected Pope Francis utters this bold and unprecedented statement, he captures the attention of the world’s population. His reforms leave no corner untouched as he strips away the mask so long held before the face of the papacy. Bringing with him and open-minded candor rarely seen by public figures – he’s an inspiration to his followers – and a threat to those who oppose him. “When I penned this novel about a fictitious Pope Francis fourteen years ago, I never envisioned that a future pope would select the name, Pope Francis I. This novel’s Pope Francis is a bold and courageous pope whose sweeping reforms reversing ancient Vatican edicts place his life in grave danger. The world can only hope and pray that today’s Pope Francis, as bold as he is, will be fruitful in his endeavors and have a lengthy and healthy reign,” said WR.PARK. So much conspiracy and death at the Vatican. Who knew? 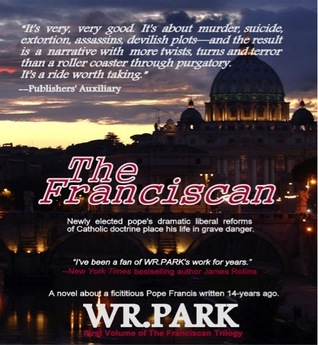 W.R. Park begins his new trilogy with The Franciscan, a novel where a man is chosen as Pope so the seat can be easily controlled, but when he reveals himself to be a sort of maverick, all bets are off and assassins wait patiently. Dom, also known as Pope Francis I, is a humorous, wily, intelligent gentleman who is not at all afraid of doing what is right. Even if the consequences do inspire fear. 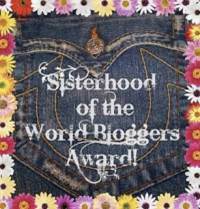 Readers will enjoy Dom's down to earth leadership, openness, and honesty. He believes that the Church can downsize it's material possessions in order to help the people who need it. He wants an open relationship with the world and he wants the religious leaders of that world to connect and work together in peace. A lot to hope for. But his ideas and beliefs are understandable. Readers will connect with Dom through his passion and his plan. However this novel isn't just a story of good deeds and humanitarian strides. It's also a story of murder, control, jealousy, destiny and power. When Cardinal Buldini decides on Dom for the papacy, he forces those under his influence to vote for him. At once, Dom defies Buldini, following his own plan for what Pope Francis I will focus on. Buldini soon realizes that he has brought in a Pope that cannot be controlled. This mistake must be rectified and the quickest way is death. While Dom and his loyal friends plan, study, decide, and discover, Buldini is out to replace the Pope. Readers will love the mysterious nature of this novel. It's similar to that of Angels and Demons but with less riddles. The plot starts off a little slow, with uncertainty as to what the new Pope actually wants to accomplish. After the first murder, the action picks up and sets a good pace for the mystery to evolve. The hardest part about this novel is the amount of characters. There are something like thirteen people helping Dom, and then there is Buldini with the rest of his villains, and a few outsiders who make their way onto the VIP list. It was difficult to keep them all straight in my mind, but at least the main characters were easy to keep track of. My favorite parts of the book were the riddled poetry and the dream predictions. Both added a little fun to an otherwise deadly situation.